There was a time when I would have laughed at someone who tried to describe to me the “luxury” of crocheted dishcloths. That was before I tried them myself! Now I understand what I was missing: the perfect combination of textured scrubbie-ness and cotton softness. 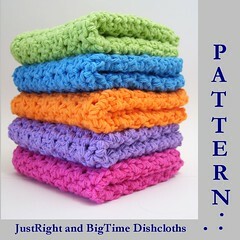 This is a *crochet pattern* in .pdf format (and U.S. notation) for making the dishcloths pictured. You’ll also need an ounce and a half (for the smaller) or two ounces (for the larger) of a worsted weight cotton yarn, a size I (5.50 mm) crochet hook), and a tapestry needle for weaving in your ends. The finished cloths are approximately 8.5 inches (21.6 cm) and 10 inches (25.4 cm) square.